NASA's space shuttle Endeavour heads to the launch pad for its final mission, STS-134, while bathed in bright xenon spotlights on March 10, 2011 at NASA's Kennedy Space Center in Florida. Endeavour will fly its 25th and last mission during the STS-134 flight. CAPE CANAVERAL, Fla. – The space shuttle Endeavour – the youngest orbiter in NASA's fleet – made the slow crawl to the launch pad Thursday (March 10), to prepare for its final launch next month. Thousands of spectators watched as Endeavour, bathed bright xenon spotlights, emerged from NASA's cavernous Vehicle Assembly Building here at the Kennedy Space Center. The trip from the 52-story building to Endeavour's seaside Launch Pad 39A, a 3.4-mile (5.2-km) drive, was expected to take about six hours, giving onlookers plenty of time to soak in the sight. "It's a fun time," Dana Hutcherson, flow director for Endeavour's STS-134 mission, told SPACE.com. "We get to view all the accomplishments and everything we've done, and the piece that we've been able to contribute to the shuttle program." Endeavour is slated to blast off on April 19 to deliver a $1.5 billion astrophysics experiment to the International Space Station. As NASA's space shuttle program winds down, employees have been able to bring their friends and family to watch the shuttles roll out for their final missions. The opportunity not only boosts morale as the program nears retirement, but also allows the employees to share their unique experiences with their loved ones, NASA officials have said. About 900 families of shuttle workers, totaling more than 3,000 people, were expected to watch Endeavour's last trip to the launch pad, according to the space agency's estimates. Hutcherson has worked as flow director for two of Endeavour's previous missions – STS-126 and STS-130. Prior to that, she served as vehicle manager for the shuttle Atlantis. "It's been a joy working on Endeavour," Hutcherson said. "Our team is really proud to be a part of just this one small part of the space shuttle legacy." Endeavour began rolling to the launch pad for the last time at 7:56 p.m. EST (0056 GMT). NASA hauled the shuttle toward its launch pad using a massive, 6 million-pound (2.7 million-kilogram) crawler transporter vehicle originally designed to move the huge Saturn rockets that launched the Apollo missions to the moon in the 1960s and 1970s. For those who have worked on the shuttle Endeavour, seeing it make its way to the launch pad for the last time is emotional, but the main priority, as always, is the successful completion of the mission and its objectives, Hutcherson said. "I keep focused on our mission, which is to fly these vehicles out safely," she said. "This is the exciting part as we get ready to launch. We're ready to send the vehicle off and to see the vehicle perform as we've prepared it to do. We'll have time for reflection, and we have – we go back and share videos and photos, and we reflect – we're a big family, so we do have that camaraderie." 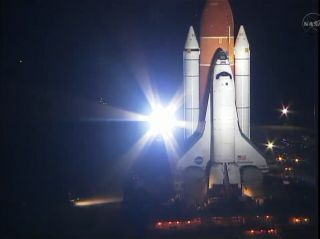 Endeavour's STS-134 mission is slated to launch April 19 at 7:48 p.m. EDT (2350 GMT) to the International Space Station. The 14-day mission will deliver an astrophysics instrument, supplies, spare parts and new hardware to the station. The mission is commanded by veteran astronaut Mark Kelly, the husband of Arizona congresswoman Gabrielle Giffords who is recovering from a gunshot wound to the head. Giffords was shot on Jan. 8 during a shooting spree by a gunman that killed six people and wounded 13 others. Kelly announced last month that since Giffords' recovery has been going well he planned to stay in command of Endeavour's mission. He even hoped she would attend the launch in person. Today, the Associated Press, Reuters and other news agencies reported that Giffords does indeed attend the mission's launch, according to statements from family members and an aide. Endeavour's main mission for its final spaceflight is to deliver an astrophysics experiment called the Alpha Magnetic Spectrometer (AMS). It will be NASA's 134th shuttle flight, as well as Endeavour's 25th and final mission before being retired along with the rest of the orbiter fleet later this year. The shuttle first launched into space in 1992. This state-of-the-art cosmic ray particle physics detector is designed to examine fundamental issues about matter and the origin of the universe. The AMS will be attached to the space station and will look for signs of antimatter, dark matter and cosmic rays beyond the Milky Way. Endeavour's launch date was moved several times due to delays with the mission just before it – Discovery's STS-133 flight. Engineers found cracks on Discovery's external fuel tank, and after extensive tests and modifications, the shuttle launched on its final mission on Feb. 24 and returned to Earth yesterday (March 9). The delay with Discovery pushed Endeavour's launch to mid-April, and similar modifications were made to its external tank. But, with the success of Discovery's recent flight, NASA managers are confident that the tank modifications did the trick. "The program has reviewed all the data from the last mission and they feel very confident about the modifications they did," Hutcherson said. Originally, Endeavour was scheduled to make its last trip to the launch pad yesterday (March 9), roughly eight hours after the shuttle Discovery landed for the final time to end its STS-133 mission. But, stormy weather forced NASA to delay the rollout by 24 hours.